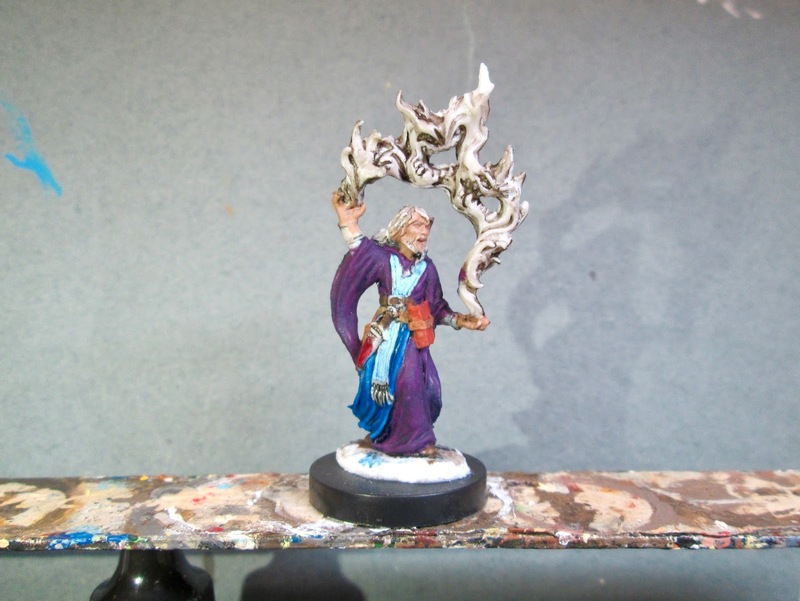 Aaron the Conjuror: Bones 2 Figure | H.A.W.K.S. 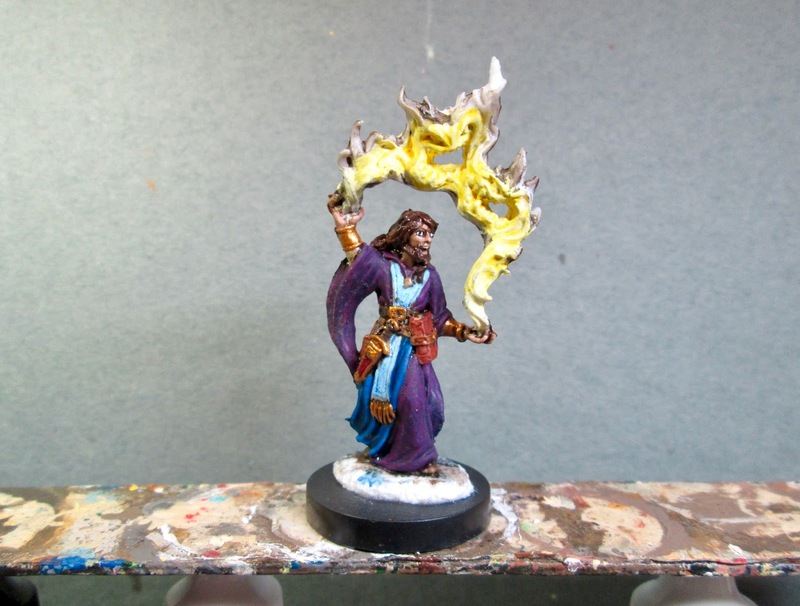 This past week I painted up Aaron the Conjuror from the Bones 2 Core Set. 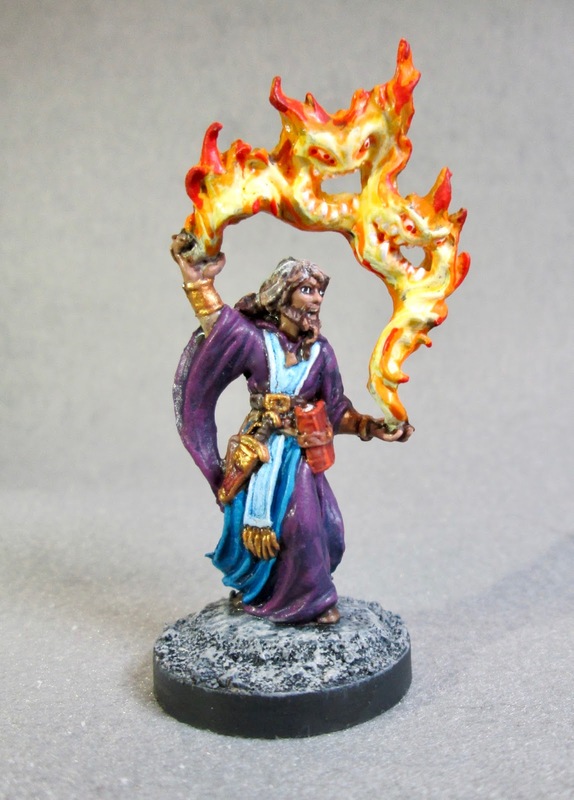 I have so many Bones characters now, (wizard especially because of Frostgrave), I thought I’d paint up some to sell on eBay. So if you are interested, I’ll put a link to the listing for this figure down at the bottom. I prepped the figure in the usual way; soaking it in a dish of water with a couple drops of dish-soap added, then giving it a light scrub with a soft toothbrush, and then rinsing and drying it. I then glued the figure to a 1" Reaper plastic base with superglue, and then glued the base-mounted figure to a tongue depressor with a couple drops of the Elmer’s glue. I began by giving the entire figure a wash with heavily thinned Reaper MSP “Grey Liner”. When that was dry, I painted his robes with Crafter’s Acrylic “African Violet”, and the apron like piece with Americana “True Blue”. I then painted the tabard with Crafter’s Acrylic “Cool Blue”. I let everything fry for a while, and then I gave the purple and blues a wash with Iron Winds Metals “Dark Blue” ink. When the ink was dry, I painted his face and hands with Reaper MSP “Tanned Shadow”. I then painted his belt, shoes, and dagger grip with Americana ‘Raw Umber", and the string-like secondary belt with Ceramcoat “Territorial Beige”. After that I painted his book and scabbard with Apple Barrel “Burnt Sienna”, and then his book-strap and pouch with Crafter’s Edition “Spice Brown”. I next painted his hair with Accent “Real Umber”. After that I painted his bracelets, belt buckles, and the metal fittings on his dagger with Accent “Mustard Seed”, and when the “Mustard Seed” was dry, I painted over it with Ceramcoat “Bronze”. I let everything dry for a while, and then gave all the newly painted warm-toned parts a wash with Citadel “Agrax Earthshade” wash. I then moved to the flame and painted it with Apple Barrel “Lemon Chiffon”. I then painted his eyes, and added teeth with Crafter’s Acrylic “Light Antique White. I also highlighted his skin with Reaper MSP "Tanned Skin”, and Reaper MSP “Tanned Highlight”. After that, I returned to the flame and gave it a wash with Iron Wind Metals “Yellow” ink. 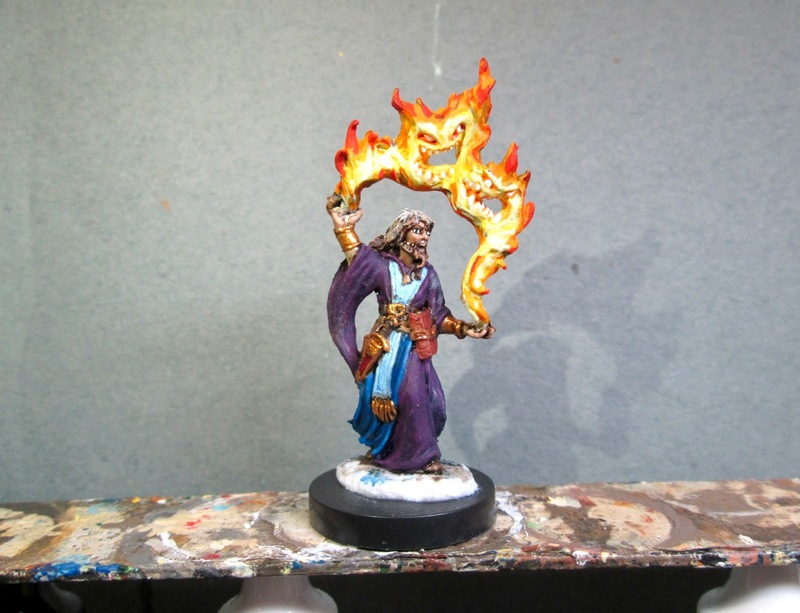 When it was dry, I drybrushed the flame with the “Lemon Chiffon”, but felt the “Yellow” ink hadn’t added enough contrast. So, I went over the areas where the faces are sculpted in the fire, this time with Iron Wind Metals “Orange” ink. That looked better, so when it was dry, I painted the eyes and the teeth in the faces with White. 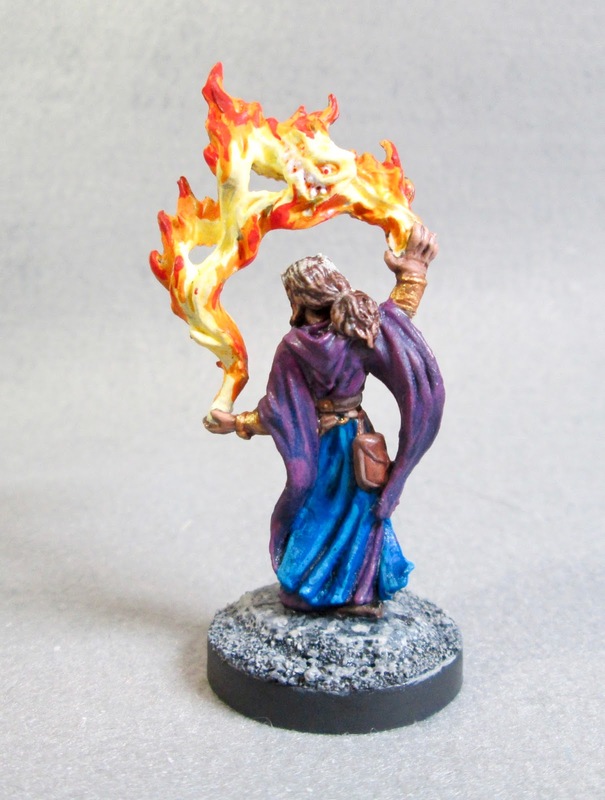 I then painted the rest of the flame, working outward with Reaper MSP “Hearth Fire”, Reaper MSP “Holly Berry”, and Reaper MSPBones “Cinnamon Red" Next, I returned to the figure, and highlighted his hair with Americana "Sable Brown”. I then drybrushed the top a little with the “Lemon Chiffon” to try a bit of OSL (object source lighting) caused by the flame on the top of his head. Next, I worked on highlighting his clothing. 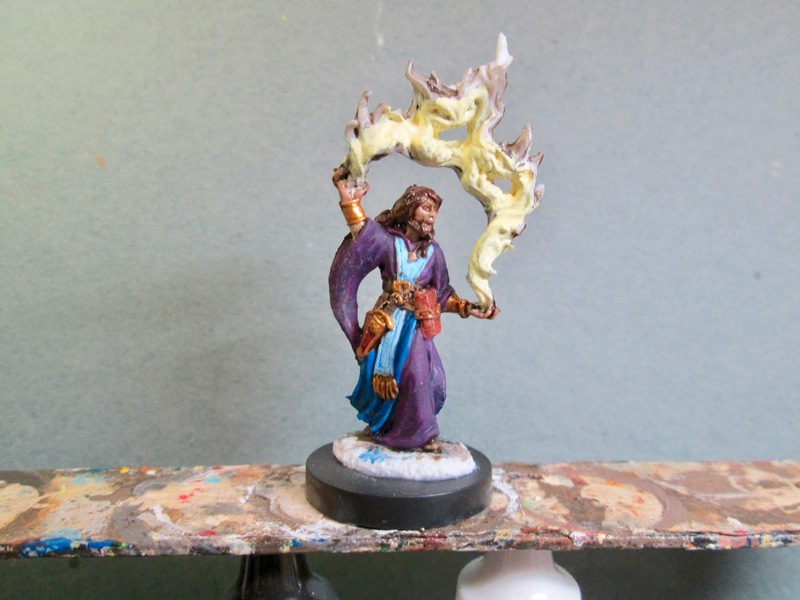 I started with Anita’s “Violet” for his robes, and used Reaper MSP Bones “Tropical Blue” for his apron like piece. I then did his tabard with Reaper MSP “Frosty Blue”, and followed with Reaper MSP “Sparkling Snow” on just the border. I then worked on his accoutrement; highlighting his main belt, shoes and dagger grip with Americana “Mississippi Mud”, and the string like belt with Folk Art “Butter Pecan”. The pouch I highlighted with Folk Art Teddy Bear Brown", and the book cover and scabbard I highlighted with Crafter’s Acrylic “Orange Spice”. I wrapped up the highlighting by highlighting all the “Bronze” with Ceramcoat “14K Gold”. 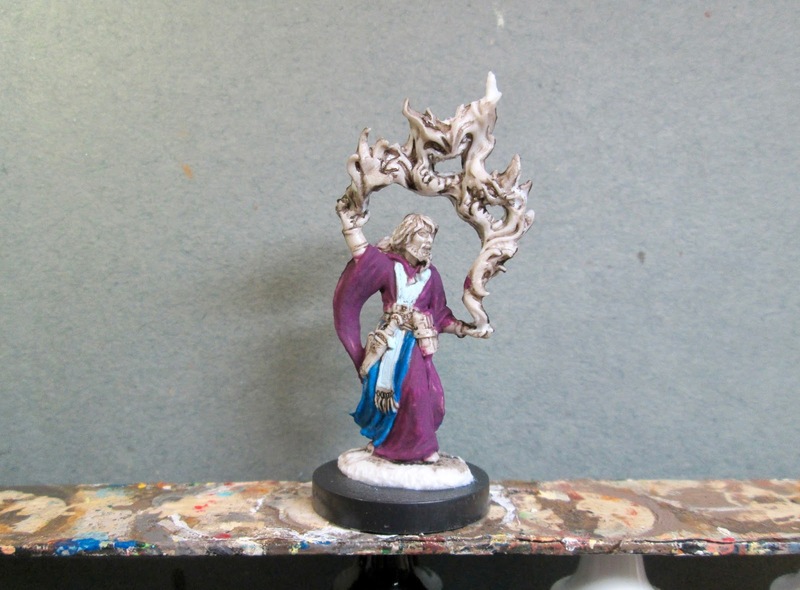 And finished the painting by painting his integral base with Black. 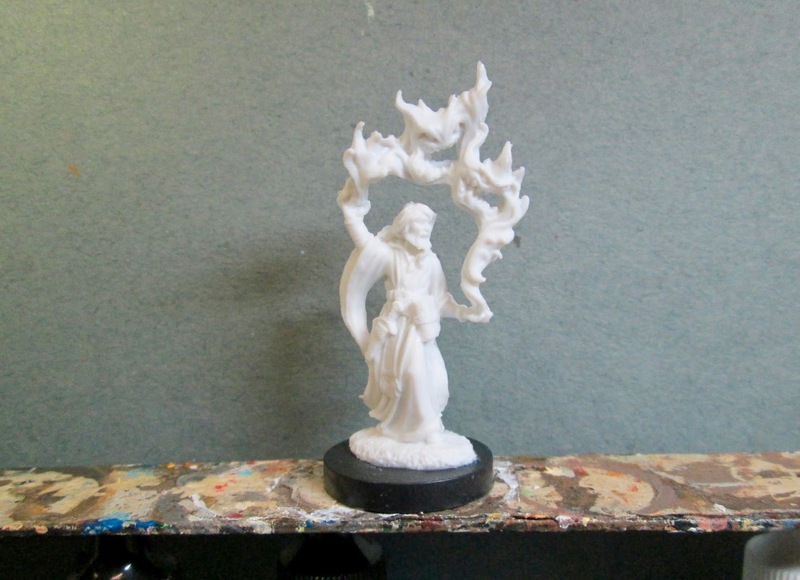 After the figure had overnight to dry, I used some white glue to glue a little sand to the base. When this was dry, I painted the sand with the Black and, when dry, drybrushed the base with some Americana “Zinc”, followed by Crafter’s Acrylic “Light Storm Cloud Grey”, and lastly some Americana “Dove Grey”.